Most Friday nights you can find me making a Papa Murphy’s pizza. After a long week of working a full and part time job and planning meals I need something easy and we love Papa Murphy’s Take ‘N’ Bake Pizza! Last Friday I tried Papa Murphy’s new Fresh Pan Pizza along with a salad and soda. 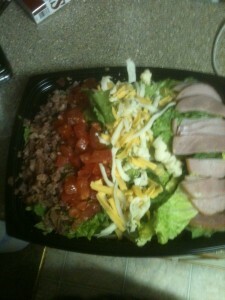 Here is the salad there was plenty for Joey, Rex and I. I love all the fresh ingredients. I called ahead and ordered the Perfect Fresh Pan Pizza. 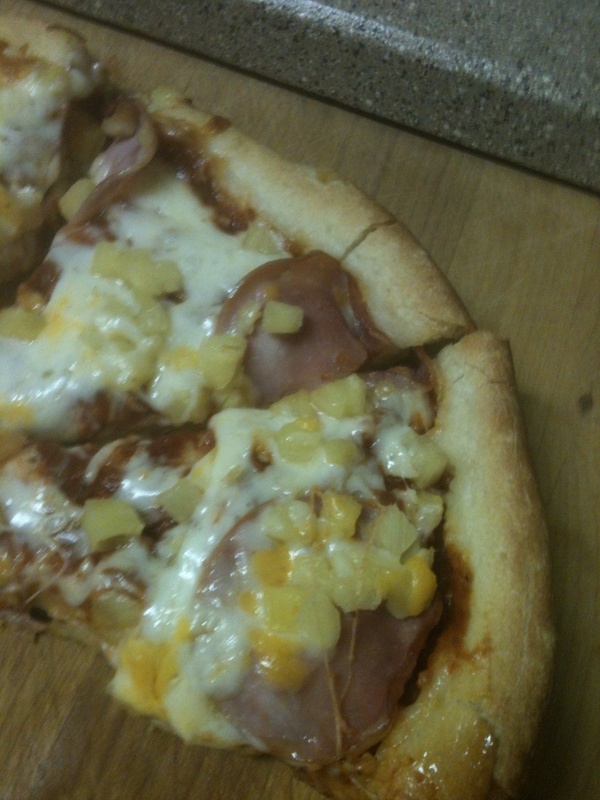 It was 1/2 Pepperoni and 1/2 Hawaiian. When I arrived at Papa Murphy’s my pizza was ready. Everyone there is always so friendly and helpful. Since this was the first time I had the Fresh Pan Pizza the girl at the counter explained that there was a layer of butter on the bottom so make sure to bake it on an even rack. She also explained that this pizza may get more bubbles and just pop them and check it after 10 minutes. She also said to take it out of the pan, put it on a cutting board and wait 5 minutes before cutting it for the best results. 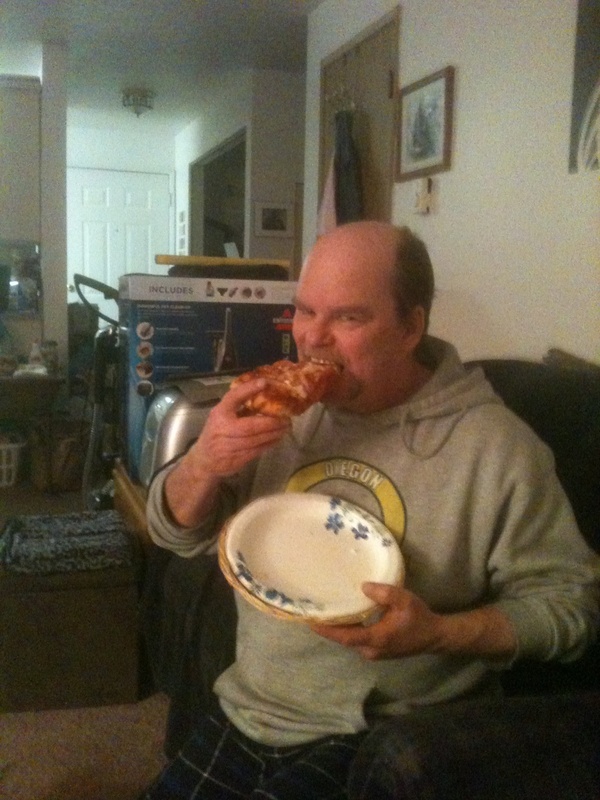 Well I have to tell you we love the Fresh Pan Pizza and will be purchasing it again. It smelled great well it baked and turned out just perfect! I love the buttery flavor. What I love most about our pizza’s from Papa Murphy is that you can customize it to what you like. We often get the Cowboy Pizza but I don’t like black olives so we get half without. I great that I can call in my order and it is ready when I get there; you can also order online. 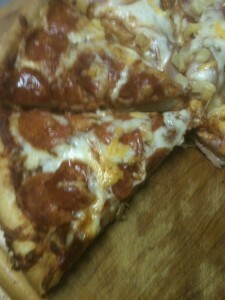 If you are looking for a good Friday night meal or any night don’t forget to check out Papa Murphy’s. You will love all the fresh ingredients and the friendly people that work there! Don’t for get to try the new new Fresh Pan Pizza. Tonight is the Cowboy on the new Fresh Pan Pizza crust for us! After years of pinching pennies and struggling to get through art school, Emma Makie’s hard work finally pays off in the form of a dream job offer. But when tragedy strikes, she has no choice but to turn down the job and make a cross-country move to Colorado Springs to take temporary custody of her two nieces. She has no money, no job prospects, and no idea how to be a mother to two little girls, but she isn’t about to let that stop her. Nor is she about to accept the help or of her handsome new neighbor, who seems to think she’s incapable of doing anything on her own. Fun, heartwarming, and romantic, Prejudice Meets Pride is the story of a guy who thinks he has it all figured out and a girl who isn’t afraid to show him that he doesn’t. It’s about learning what it means to trust, figuring out how to give and to take, and realizing that not everyone gets to pick the person they fall in love with. Sometimes, love picks them. I found some great products from Rustico. 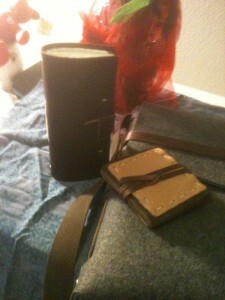 They provide high quality leather products that fit anyones lifestyle. Rustico prides itself on using environmental friendly materials and having each product made in the USA. They make all their product to order. Their craftsmen have years of experience and specialize in a fusion of old-world methods and simple, modern designs. I received a couple different items from Rustico. 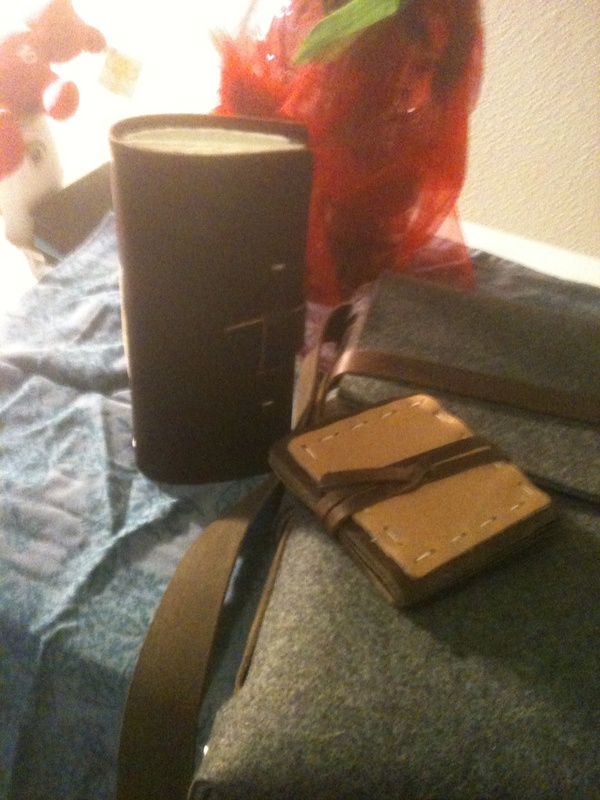 The first item is the Wine Log with a hand sewn spin. I love the rustic look and it has a lot of room to record your wine. Rustico also has log books for hunting, fishing, golf and a number other hobbies. I really like that it is made out of 5mm thick 100% Virgin Merino Wool. It is strong and it is great to carry my kindle or iPad in while I am out and about. It is strong and will hold a lot of items. 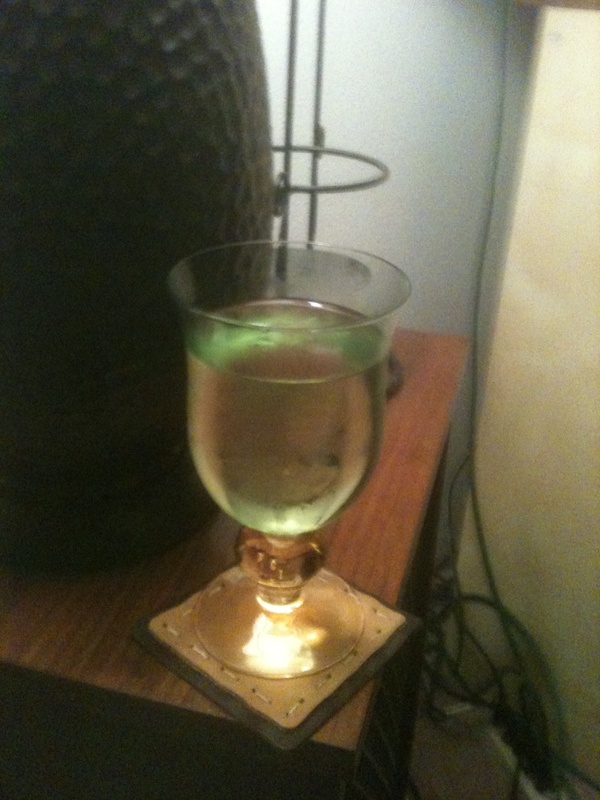 The third item is the one that will get the most use and I love them – it is the two-tone color Coaster Set. Not only do they look great they are something that I will use every day. They are made from top-grain cowhide. I love the hand-sewn detail. I can tell these are durable and will last us a long time. They are practical and they look classy. They are good for home, office, or vacation home. The next time you are looking for some unique gifts for yourself, family or friends be sure to take a look at all the different products that Rustico Leather offers. You will know that each pieces is durable, long lasting and unique. Who doesn’t love Hazelnut and Chocolate? I love them both and together they are wonderful! I recently tried Nocciolata Organic Hazelnut Spread with Cocoa & Milk. It was so good. It is a delicious chocolate spread, made of an organically farmed hazelnut paste (16%), and sweetened with organic cane sugar. Among the other ingredients stand sunflower oil, skim milk powder, and cocoa butter. The Rigoni di Asiago company goes back 100 years and was started by the Rigoni grandmother, Nonna Elisa, whose craftsmanship and love of nature so greatly influenced her family. Today it is run by her grandchildren. 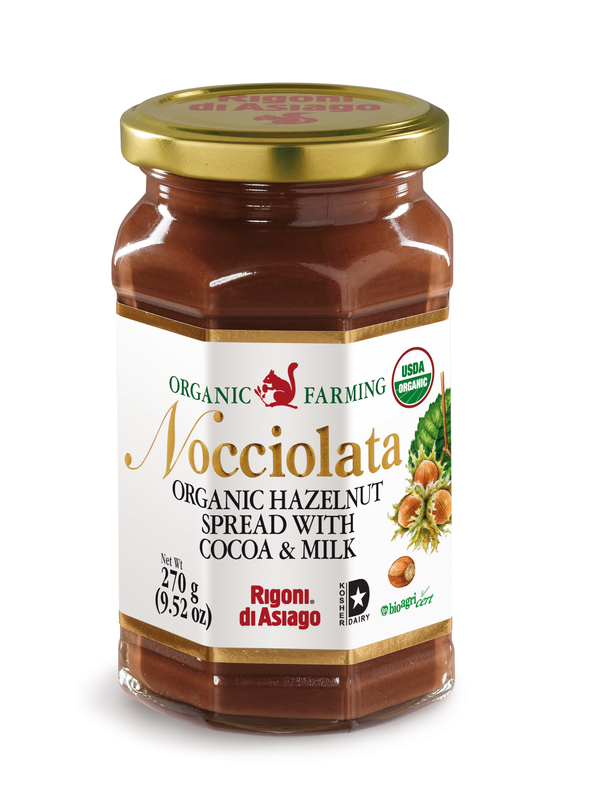 I loved eating the Nocciolata Organic Hazelnut Spread on toast in the morning. It reminded me of the few weeks I spent in Amsterdam ~ that is what everyone had for a mid morning snack. I also enjoyed the spread on some rice cakes in the afternoon. What I really wanted to do was make some cookies using this spread instead of peanut butter – but Rex and Joey both liked it and ate it all before I had a chance to make cookies. I will have to get some more. Not only is Nocciolata taste great but it is natural, certified organic, and guaranteeing ingredients that are farmed without polluting the environment. Only the finest ingredients are used such as Italian hazelnuts, cocoa and cocoa butter, cold pressed sunflower oil, vanilla, raw cane sugar and skimmed milk. There is also no trans fats, palm oil, artificial aromas, colors or flavors. It is also gluten free. The next time you are looking for a chocolate hazelnut treat make sure you reach for Nocciolata. You can find it at many local stores like Whole Foods, Market of Choice and Woodmans. You can also buy it HERE online and have it shipped right to your front door. Follow Rigoni di Asiago on Facebook to keep updated on what’s new. 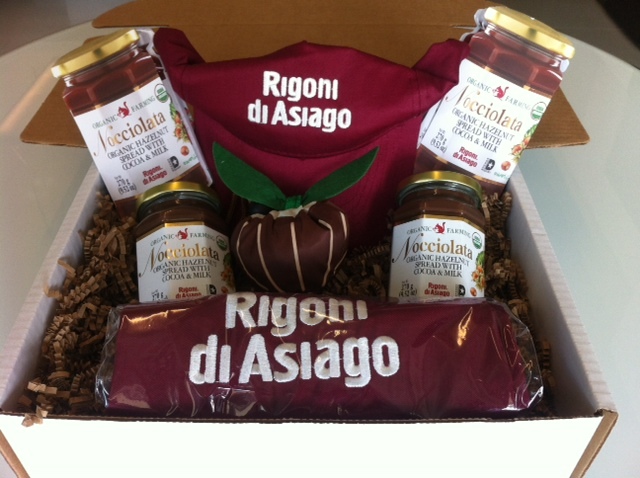 Rigoni di Asiago would like one of my readers to enjoy a 2 jars of Nocciolata Organic Hazelnut Spread. You need to be 18+ US (48) shipping. Leave a comment on what you would use the spread on. 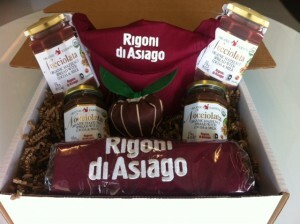 Extra entry for following on Rigoni di Asiago on Facebook. Extra entry for each way you follow Kaisy Daisy’s Corner. Giveaway ends Mar 12, 2014. Enter daily for more chances to win. In Portland Oregon we don’t really get much snow, but this year we had a weekend were we received 6+ inches of the white stuff. It pretty much shut down the city and I worked from home a few days. 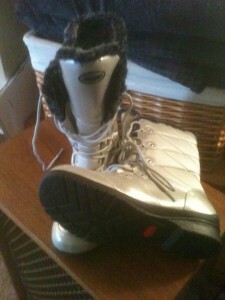 I was so glad I had these cute warm boots from Khombu. The style is called Angel and they have a faux fur lining which is antibacterial, breathable, and fast drying. The boots were very comfortable and warm. They feature a comfort insole with Thermolite protection which helped keep my feet warm and they had good cushion. Around the third day of the storm we had freezing rain and I was so happy with the non-slip outsole. It had great traction and I was able to get outside with out the fear of falling down. For a couple days we had snow and mud outside so these boots came in very handy. These boots would be great for the Midwest with all of their cold and snow. They are so stylish and nice looking you could wear them anywhere. If you would like to get your own Khombu Angel Books you can find them at Zappos.com and many other places. You can follow Khombu on Facebook, Twitter, and Instagram. Don’t forget to enter to win $50 Amazon Gift Card or Paypal Cash! Melissa Lee LeGette has been writing seriously since she was a teen. She loves an old world vibe with a magical twist, and she puts her full focus on creating believable characters–even if they happen to be a talking beer mug. 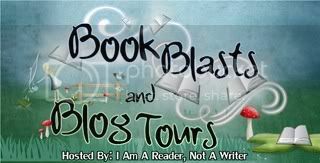 Her books are targeted for children and teens, but have been enjoyed by adults of all ages. I love trying new products and I have been using Booda Butter from Booda Organics. It is a great 100% pure daily moisturizer. It crafted by hand in small batches and made with care. It contains Shea Butter, Cocoa Butter, Coconut Oil, Jojoba Oil, and Olive Oil. It smells great! Booda Organics uses only the highest quality, organic and vegan ingredients. It never contains any harmful toxins or pollutants. I love using it when I get out of the shower. My skin just soaks it up. It comes in both a tin so you can use it all over and a tube so you can easily apply to your lips. I have mine handy all the time in my purse. I love how versatility the butter is. You can use it on your skin, hair, lips and more. In fact they have a list of 5o different ways to use Booda Butter that you can read HERE. I like to use it out of the shower and also to shave my legs. It also helps my lips feel soft and smooth ~ good bye chapped lips! Booda Organics grew from their own personal desire to only use pure body care products that we could trust for their selves and loved ones. Discovering that truly unadulterated products are very difficult to find, they decided to just make our own… So after a little lovin’ in the kitchen, BOODA BUTTER moisturizer was first born! I think you will like the feel and smell of Booda Butter as much as I do. You can order it HERE. You can also find it in many local stores like New Seasons and Zupans Market. You can stay connected with Booda Organics on Facebook. I also have two great gift sets to send out to two of my readers. 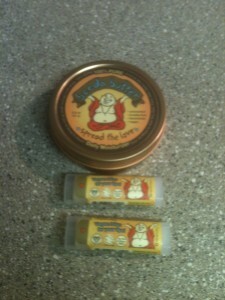 For one reader the Booda Butter Gift Set the other a 3 pack of Lipbalm. You must be 18+ US(48) shipping address. Leave a comment on what of the 50 ways to use Booda Butter would be the best way for you to use it. Extra entry for following them on Facebook. Extra entry for each way you follow Kaisy Daisy’s Corner. Giveaway ends Mar 11, 2014. Enter daily for more chances to win. Enter Today | 2/10 – 2/27! About the Author: Barbara Cameron is a best-selling author who has a heart for writing about the spiritual values and simple joys of the Amish. She is the author of more than 38 fiction and nonfiction books, three nationally televised movies, and the winner of the first Romance Writers of America Golden Heart Award. Barbara is a former newspaper reporter. Some of her non-fiction titles include the Everything Weddings on a Budget Book and Her Restless Heart: A Woman’s Longing for Love and Acceptance. Cameron currently resides in Edgewater, Florida. I really enjoyed reading this A Road Unknown. I thought it gave a lot of insight on how the Amish Community lives. I also like that Elizabeth was put in the English setting. I liked both of the men who wanted more than friendship. My favorite of the two was Bruce. You will have to read A Road Unknown to see what life Elizabeth chooses in the end. It may make you think about the decisions you have to make. Do you ever have a problem finding your keys in your purse? Do they fall to the bottom and you have to take everything out to find them? Every night at work when it is time to leave one of my co-works is looking for her keys – checking her pockets or digging in her purse. I am always waiting for her. I don’t have a problem finding my keys because I found this great product called Finders Key Purse Key Finder from Isn’t It Clever. You just attach your keys to the clasp and slip the Finders Key Purse® keychain over the edge of your purse, backpack, gym bag or what ever you carry. I never have problems finding my keys. 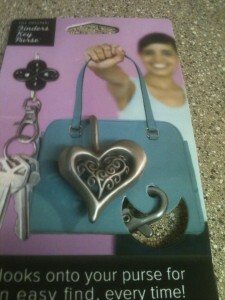 I think for her birthday she will be getting a Finders Key Purse Key Finder from me. I can’t tell you how much time and frustration it saves me. 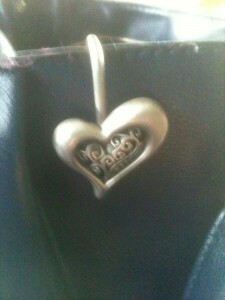 Here is mine – it is a cute Filigree Heart. I love how easy it is to find my keys and how great the it looks! They have all kinds of designs including your favorite college team, artistic, inspired, even flowers and animals. There is one for everyone! If you would like to purchase your own Finders Key Purse designs you can do so HERE. You will probably want to order extra so you have some to give as gifts – perfect for your mom, daughter, aunt or friend. You can also connect with them on Facebook and Twitter. Isn’t This Clever has offered one of my readers the chance to get a bit more organized with their own Finders Key Purse key chain. You must be 18+ US (48). Leave a comment on what design you like the best. Extra entries for following them on Facebook and Twitter. Extra entry for each way you follow Kaisy Daisy’s Corner. Giveaway ends Mar 7, 2014. Enter daily for more chances to win. Do you ever think of going back to school? If so what would you go for? I have a friend who I was helping just the other day look for classes to become a CNA. She was already taking care of an older couple at home but wanted to get the proper training and certificates. Well I was helping her I found this great site called Find CNA Classes. What’s great about this site is that it list each state and what is required to become a CNA in that state. It gives you a comprehensive description of what is needed and what kind of facilities use CNA’s. Then it list the places you can go and what type of classes they offer. What are certified nursing assistants? Where can I find CNA classes? What can I expect in a CNA class? How can I study for CNA Programs? What is the cost of CNA classes? What is the level of difficulty for CNA classes? What happens after the completion of CNA courses? What schools offer CNA programs? What types of courses are required to become a CNA? Is this career the right choice for me? Are there free CNA Classes? This site provides a lot of great information so that you can make the correct decision on your future. It includes information on CNA Classes, CNA Classes Online, CNA Certification and even CNA Practice Test. If being a CNA is something you are thinking about get all your answers in one spot from Finding CNA Classes.